Colombia is located in northwestern South America, bordered to the northwest by Panama; to the north by the Caribbean Sea; to the east by Venezuela and Brazil; to the south by Ecuador and Peru; and to the west by the Pacific Ocean. Independence from Spain was won in 1819, but by 1830 "Gran Colombia" had collapsed with the secession of Venezuela and Ecuador. 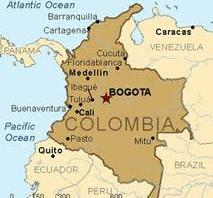 What is now Colombia and Panama emerged as the Republic of New Granada. The new nation experimented with federalism as the Granadine Confederation (1858), and then the United States of Colombia (1863), before the Republic of Colombia was finally declared in 1886. 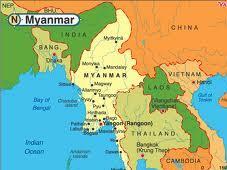 Burma is a country in South Asia and Southeast Asia. It is, bordered by India, Bangladesh, China, Laos and Thailand. The country was colonized by Britain following three Anglo-Burmese Wars (1824–1885). British rule brought social, economic, cultural and administrative changes to the once-feudal society. Since independence in 1948, the country has been in one of the longest running civil wars among the country's myriad ethnic groups that remains unresolved. From 1962 to 2011, the country was under military rule. The State Peace and Development Council was the official name of the military regime of Burma (also known as Myanmar), which seized power in 1988. It rejected the 1990 election results and kept Aung San Suu Kyi under house arrest until her release on 13 November 2010. The council was officially dissolved on 30 March 2011, with the inauguration of the newly elected government, led by its former member and Prime Minister, President Thein Sein.